4. About 50 minutes into the simmering, cook the pasta in 1 1/2 to 2 quarts of boiling water over high heat. Cook for 10 minutes or just until the pasta is al dente, or slightly tough. Drain. Olive Garden Pasta e Fagioli it is not, sorry Todd. I have been going to OG since the 90's when they offered freshly made pasta. 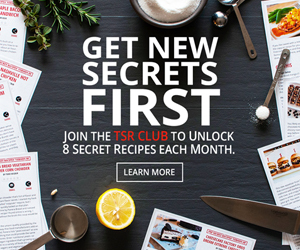 I love your cc recipes but this one is a miss in terms of OG, its way too thick. Cooking canned beans for more than 10 mins allows them to break down and not be whole. Canned beans only need to be heated through. 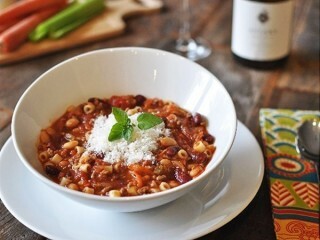 OG Pasta e Fagioli is very brothy this version is very stew-like, its way too thick for OG. I had to add some broth to dilute. The flavors, however, are very nice and enjoyable. But, OG Pasta e Fagioli, a big NO. LOVE! LOVE! LOVE! Made this yesterday for lunch following the recipe to the letter. AMAZING!!! Have had it for lunch yesterday and today, also for dinner tonight. For this recipe I am so very glad we only have the two of us! Hubby was dubious about even trying it, however he ate a huge pasta bowl of it. It is a winner by any standards. Wil be making it frequently now that I have found your recipe. Thank you Todd Wilbur!